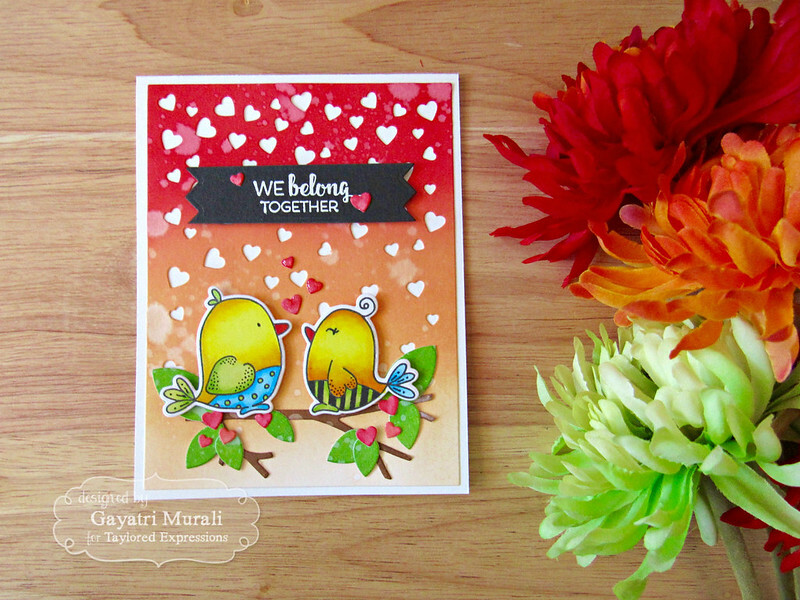 I am back sharing a card I made using Taylored Expressions stamp sets and dies. These products were released in December 2016 and are valentine themed. 1. Blend Candied Apple and Dried Marigold distress inks on Sugar Cube cardstock panel. 2. Spatter clean water to add texture to the panel. 3. 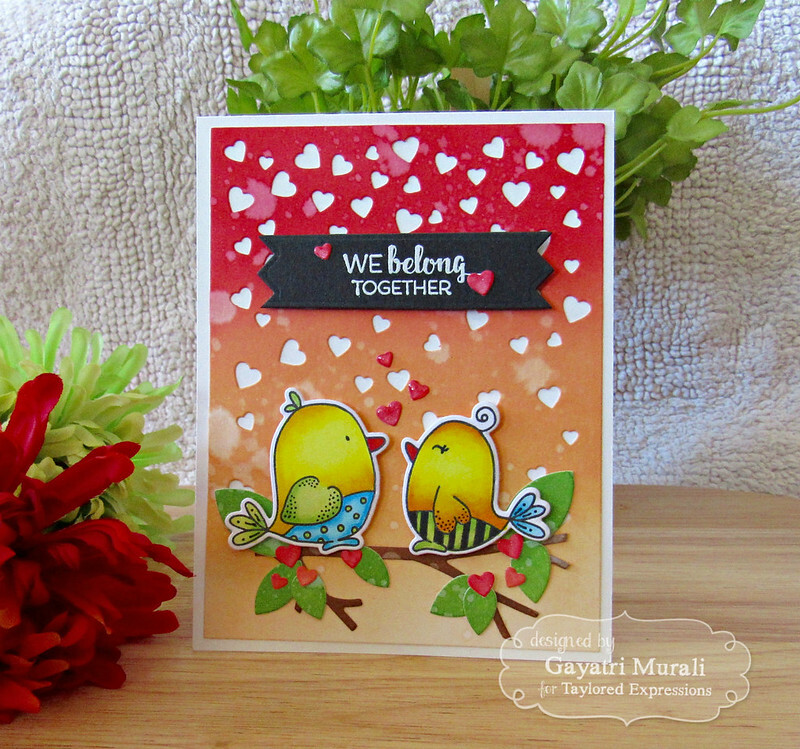 Die cut this panel using Falling Heart cutting plate from Taylored Expressions and adhere on Sugar Cube card base. 4. Stamp the bird images from The Birds and the Bees stamp set from Taylored Expressions using Oreo hybrid ink. 5. Coloured them using copic markers and die cut them using the coordinating dies. 6. Sponge Gathered Twigs and Mowed Lawn distress inks on a scrap piece of white cardstock and spatter with clean water. 7. Die cut the branch and leaves using On the Limb – Branches and On the Limb – Leaves dies also from Taylored Expressions. 8. I adhered the leaves on the branches and adhered on the bottom of the panel. 9. I adhered the birds on the branches using foam adhesives for added dimension. 10. 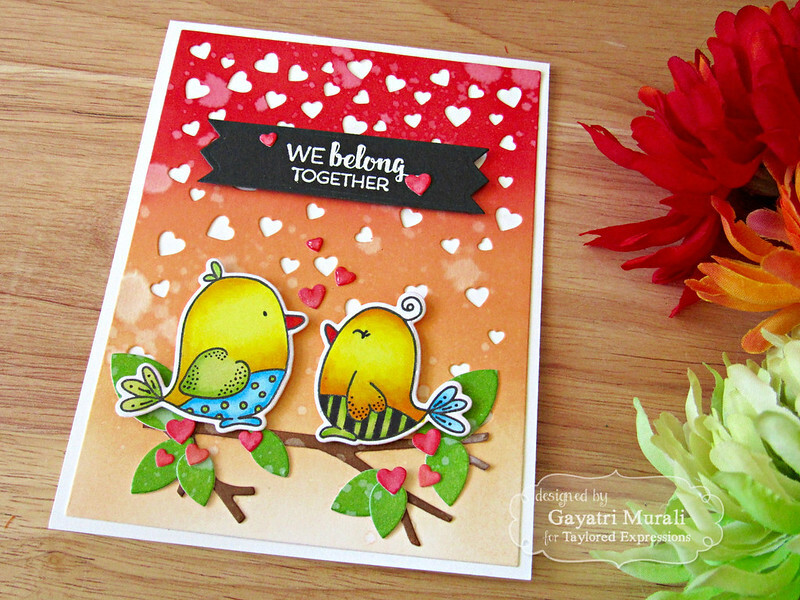 I white heat embossed the sentiment from The Birds and the Bees on Oreo cardstock and die cut using the second smallest die from Banner Stacklets 4. 11. I adhered this on the top middle of the card front using foam adhesives. 12. 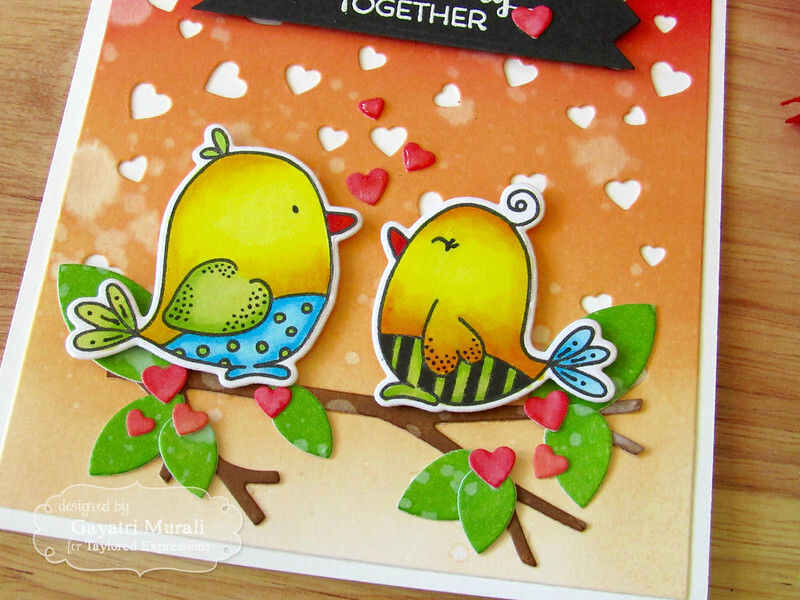 I used the tiny hearts left over from die cutting the sponged panel to embellished the card. I brushed the heart with Wink of Stella clear shimmer and added glossy accent on the heart above the birds only. Some more photos of the card for you. The supplies used to make my card is listed below. Looks fabulous! Your background blended so nicely and those birds sure are cute.